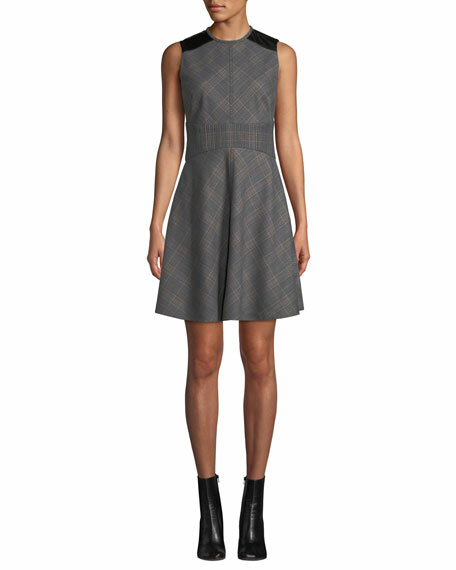 Rebecca Taylor dress in slub twill with frayed-edges. For in-store inquiries, use sku #2433649. 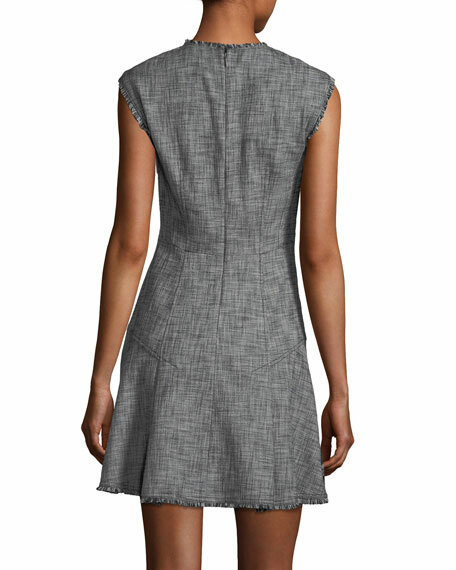 Derek Lam 10 Crosby dress in check suiting with faux-leather trim. Crew neckline. Sleeveless. Corset overlay at waist. Fit-and-flare silhouette. Hem hits above knee. Back zip closure. Polyester/viscose/spandex; polyester lining. Polyester/polyurethane combo. Imported. Halston Heritage "Maggie" dress in faille. Split neckline. Short cap sleeves. Fit-and-flare silhouette. Fitted princess seams. Hidden back zip. Mini-length hem. Silk/cotton self. Polyester lining. Dry clean. Imported. Jonathan Simkhai dress with geometric applique detail. Jewel neckline with illusion strapless yoke. Short sleeves. Fit-and-flare silhouette. Concealed back zip. Tiered lace hem. Viscose/acetate/spandex. Combo, polyester. Imported.